Supporters of domestic violence survivor Marissa Alexander will blanket the courthouse lawn in Jacksonville with quilts ahead of her sentencing on Jan. 27. In 2010, nine days after giving birth to a premature baby girl, Alexander was attacked by her estranged husband Rico Grey. It was not the first time he assaulted her, but this time, after unsuccessfully trying to escape, Alexander tried to ward him off by firing a warning shot. Her husband stopped, left the house and called the police. Although no one had been hurt, Alexander was arrested and charged with aggravated assault with a deadly weapon. Alexander’s trial highlights how the experiences of domestic violence survivors are disbelieved and dismissed by the legal system. Before the trial, Grey admitted, as part of a 66-page deposition, that he had not only abused Alexander during their relationship, but had also been abusive to the other four women with whom he had children. Nonetheless, the district attorney continued with her prosecution. During her trial, evidence of Grey’s continued violence towards Alexander was presented, including testimony by family members. Nonetheless, the judge instructed the jury to consider self-defense only if Alexander had proven, beyond a reasonable doubt, that her husband was committing aggravated battery when she fired. His instructions shifted the burden of proof from the prosecutor onto Alexander. The jury deliberated for only 12 minutes before convicting her. The prosecutor then chose to add Florida’s 10-20-Life sentencing enhancement, which requires a 20-year mandatory sentence if a firearm is discharged. The prosecution and incarceration of domestic violence survivors is not uncommon. As I’ve mentioned in earlier columns, domestic violence is widespread, both in and out of prison. The U.S. Department of Justice found that more than half of the women in local jails and state prisons have experienced past physical and sexual violence from their loved ones. But when abuse survivors face the court system, they have to overcome narratives that deny their experiences of violence or blame them for it. No one knows how often they succeed since there are no nationwide statistics on how many women are in prison for abuse-related convictions. Unlike many other survivors in the criminal punishment system, Alexander’s case captured national attention. Her sentencing coincided with George Zimmerman’s shooting of Trayvon Martin, thus eliciting comparisons in the use of Florida’s Stand Your Ground law, under which a person who has a reasonable fear of death or harm is allowed to threaten or use force that may harm, or even kill, their presumed assailant. A pretrial judge denied Alexander’s attempt to argue Stand Your Ground; Zimmerman, on the other hand, was allowed to utilize the statute as his defense and was ultimately acquitted. That Angela Corey prosecuted both cases provoked further attention — and outrage. People across the country, many of whom are survivors of domestic violence and anti-violence activists, mobilized to help overturn her conviction, forming the Free Marissa Now campaign to highlight the injustice of the legal system’s re-victimization of a survivor of domestic violence. They organized teach-ins and fundraisers, both in their respective cities and towns as well as online. The protracted outreach worked. Media picked up on the difference in treatment between Zimmerman’s and Alexander’s attempts to argue Stand Your Ground, with guests on talk shows and bloggers bringing Alexander’s name into the nationwide discussions about George Zimmerman, Trayvon Martin and the concept of self-defense. In September 2013, an appeals court overturned her conviction, determining that the judge’s instructions were flawed, and ordered that she receive a new trial. Alexander was held in prison for two more months before being released on a $200,009 bond. In the meantime, the Free Marissa Now campaign continued to draw attention to her continued prosecution. Poet Nikky Finney wrote a poem called “Flare,” both about Alexander’s specific case as well as the history of the devaluing of black women’s lives. Finney and other supporters invited various people (including me) to film themselves reading the poem, then spread the videos through social media to continue drawing attention to her case. They continued to organize fundraisers in various cities as well as online to pay for Alexander’s bond payment and ankle monitor — not to mention the legal fees for her upcoming trial. Artists, including Molly Crabapple, Dignidad Rebelde and Bianca Diaz, created and donated art that was reproduced on buttons and t-shirts. Between November 2013 and March 2014, supporters raised more than $63,000. But the outpouring of public support, which included hundreds of letters urging her to drop the case, did not sway Florida prosecutor Angela Corey, who vowed to seek a 60-year sentence for Alexander. On Nov. 24, Alexander accepted a plea deal which includes time served for the 1,030 days she spent behind bars, an additional 65 days in jail and two years of house arrest while wearing an ankle monitor. During those two years, she will be responsible for the $105 weekly cost of her ankle monitor, a total of $10,920. Alexander was immediately taken to the Duval County Jail to await her Jan. 27 sentencing hearing. Supporters continue to mobilize around her case. On Jan. 17, 10 days before Alexander’s sentencing date, supporters kicked off a campaign called 10 Days to Black Freedom, planning to raise $10,000 to cover the $10,920 of the ankle monitor. Within three days, they had already exceeded their goal, which will not only enable Alexander to pay for the ankle monitor, but also cover other expenses she may incur while unable to work — or even leave her house without prior permission — for the next two years. Supporters are also planning to converge in Jacksonville in a demonstration of support on the day of Alexander’s sentencing. Nearly a dozen have formed the East Bay Caravan, traveling from Oakland to Jacksonville to attend the sentencing. Their two-week journey includes stops in approximately 15 cities where they held teach-ins, dropped banners, distributed fliers and engaged with local activists. 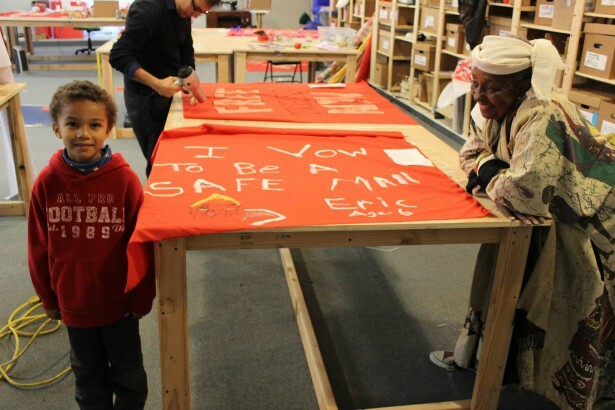 Organizers from the Baltimore-based Monument Quilt project will also be driving south, bringing with them a quilt of stories measuring 100 by 150 feet. The Monument Quilt connected with the Free Marissa Now campaign while on tour this past summer. Originally, organizers planned to bring the quilt to Jacksonville for the first day of Alexander’s trial. When Alexander accepted a plea bargain, they shifted their focus to her sentencing date. Approximately 50 people responded to the call to create quilt squares specifically supporting Alexander. 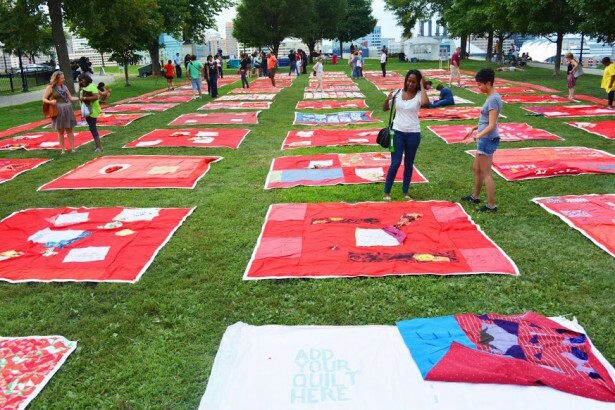 Some squares came from organizations like the Inheritance Quilt, a domestic violence awareness project; the Black Student Alliance at Yale University; and Power Inside, an advocacy group working with incarcerated women in Maryland. Individuals also created squares. Some state “Free Marissa Now” or ask, “How can you prosecute people for surviving?” Others are created by people who have lost loved ones to domestic violence-related murders. “My father murdered my mother in front of me and my brother,” stated one.